I have always taken quite a behavioralist approach to building trust with my pupils. Rules, routines and expectations, clearly communicated and firmly but caringly followed up. I feel it is my role to ensure not just the physical safety of pupils in my class, but also the emotional. I need to challenge when one pupil laughs at another, or calls another a name if they do something wrong. I need to ensure that comparison between pupils are not the driving force of learning, but comparison between personal performance is. I need to model that mistakes are an essential part of learning and that they are perfectly acceptable to make within the lesson. I have found it is this approach, not developing relationships that build trust. Relationships are the ends, not the means to building trust. Start small – you know yourself and you know your students. FInd what you think might work for them and give it ago. Use lesson zero – don’t jump in the deep end. This is a lesson prior to starting cooperative learning where you explain to your students about the cooperative learning approach. I used the 10 Toss Challenge in a lunchtime session to introduce the change of structure to my summer lessons. Understand the Cooperative Learning model and use one or two elements – Dyson and Casey’s model of cooperative learning has five key elements; positive interdependence, face to face interaction, indvidual accountability, interpersonal and small group skills and group processing. I decided to focus on the last two elements. Learn to teach in a new way – Be patient, both with the children and with yourself. A change of teaching styles can cause problems, so be prepared to be uncomfortable and for things not going how you want them to. I started small and focussed on implementing Learning Teams and Group Processing within those classes. A learning team is essentially a small group (3 to 5 students) where they have an additional role assigned on top of being a performer. As my classes are 32 students in size it worked well to have 8 learning teams of four pupils, which I chose prior to the start of the unit of work and shared with them in lesson zero. They then stayed in these teams for the whole term. The roles I used were; analyser (responsible for understanding the learning objectives, sharing them with team mates then leading the group processing at the end of the lesson), physical coach (responsible for leading and supporting on tasks that required physical development), technical coach (responsible for leading and supporting on tasks that required technical development) and equipment manager (responsible for ensuring the learning team had the required equipment for the task). In addition they all had the responsibility to be encouragers for each other’s performance. Group Processing is a debrief session. Essentially a student guided discussion but driven by the teacher. The learning team tries to make sense of the task and their individual or teams performance within the task. This gives a chance for students to talk about what they have done, but it does require guidance and structure. As simple as getting the students to discuss and answer the following questions: What did I do? What do I now know? What do I need to know next? I use it both during (individual teams) and at the end of lessons (whole class) and keep it brief. The combination of ‘no hands up’ and everybody being able to summarise the groups answer has worked to ensure that all students both contribute to the discussion and listens to what others say. It also gives me as a PE teacher valuable insight into my students that can help with the planning of future lessons. Finally as the learning teams are small I can begin to explicitly teach positive social skills (or challenge the negative ones) that are needed to support students physical development and motor competency. I still believe that routine is a key way of building a positive learning environment. One that supports children to have a go and to take a risk in the the knowledge that they will be both physically and emotionally safe to do so. However I have changed my mind on Cooperative Learning. The consistent and sustained use of the Cooperative Learning Model within PE can create those routines and that desired environment, but it takes time and patience to build. However the time you invest in building them into your classes I believe will pay off in the long run. So start small and give it ago. Reading this is like re-reading the initial drafts of the book and my use of the model as a teacher. It is great to see how the things we learnt are being used here and yet how they are adaptable. Starting small is so important, as is lesson zero, and here they are paying dividends. It is fantastic to read as an advocate and author and I look toward to reading more about your learning and teaching and your students’ learning in the future. Hi Ash. I think with any model starting small is key to it’s success. I would also add that we need to be clear why we are implementing a model (not just for the sake of implementing it) and also that a lesson is the wrong unit of measurement to decided whether the implantation has been successful. In the past I would have perhaps implemented a certain model because it was a popular thing to do, but now I realise you have to be clear about it’s purpose within the curriculum. For me cooperative learning gives a structure on building both personal and social responsibility and allows for the explicit teaching of social skills such as listening and questioning ideas. These impact the culture of the classroom which means there is a greater chance that students will take risks to develop their physical competence. Also that if for a number of lessons it is messy, chaotic and ‘not working’ compared to a more traditional method of teaching, that doesn’t mean you should give up but look to refine and adapt the method for it to fit in your context. Thank you to you and Ben for writing the book and giving some clear principles to work upon. I particularly enjoy cooperative learning and the different dimension it brings to the class, as you said giving everyone accountability in the lesson. Will you now try to implement this in other areas? Hi Thomas. That’s a good question. I have been thinking about it quite a bit over the holidays and I shall make it the basis of organisation for all my PE classes. I hope this will then allow me to teach social skills explicitly rather than just hope they emerge by putting them into teams or groups. 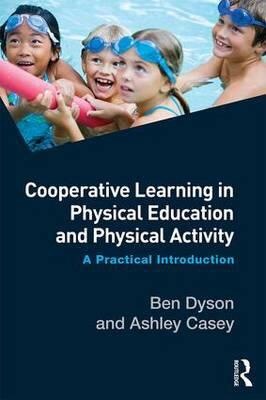 Therefore whether i teach rugby, or gymnastics, swimming or health related activities, Cooperative learning will underpin my routines to those lessons. I will then add other Models on top. So if I am teaching rugby I will predominantly use a Game Sense approach, supported with the learning team structure of Cooperative Learning. I hope that makes sense? Will you be using any of the approaches from the model? I would love to say I have an excellent well practiced cooperative learning method in place for all concepts covered in PE. At the moment I’m still experimenting with which model is best suited for which grade level; for example the sports education model I will introduce this year to broaden the pupils’ horizons on what professions sport can offer them. Reading Dr. Casey’s book is next on my list. The more and more I use certain models and the more comfortable I become with them, the more that I see it is better to pick the model depending on the situation. That situation depends on a number of following factors such as prior knowledge of children, primary and secondary learning outcomes, teacher expertise, facilities and resources. I’m still currently picking the model to fit in the curriculum, I feel in future that I will become more confident to pick the model dependent on the factors I have described. What do you think?